Festival, 1987; Special Oscar, honoring the body of his work, 1993; Honorary Doctor of Humane Letters, Columbia University, New York, 1970. Died: Italy, 31 October 1993. Il Bidone , with Ennio Flaiano and Tullio Pinelli, Paris, 1956. Le notti di Cabiria di Federico Fellini , edited by Lino del Fra, Rocca San Casiano, Italy, 1957. La dolce vita di Federico Fellini , edited by Tullio Kezich, Bologna, 1960; New York, 1961. 8 1/2 di Federico Fellini , edited by Camilla Cederna, Rocca San Casciano, Italy, 1963. Giulietta degli spiriti , edited by Tullio Kezich, Rocca San Casciano, Italy, 1965; as Juliet of the Spirits , New York, 1965. La mia Rimini , Bologna, 1967. Tre passi nel delirio , with Louis Malle and Roger Vadim, Bologna, 1968. Fellini Satyricon di Federico Fellini , edited by Dario Zanelli, Bologna, 1969; as Fellini Satyricon , New York, 1970. Il primo Fellini: Lo sceicco blanco, I vitelloni, La strada, Il bidone , edited by Renzo Renzi, Bologna, 1969. Federico Fellini, Discussion No. 1 , Beverly Hills, 1970. I clowns , edited by Renzo Renzi, Bologna, 1970; 2nd edition, 1988. Early Screenplays: Variety Lights, The White Sheik , New York, 1971. Roma di Federico Fellini , Rocca San Casciano, Italy, 1972. Amarcord , with Tonino Guerra, Milan, 1973; published as Amarcord: Portrait of a Town , London, 1974. Federcord: disegni per Amarcord di Federico Fellini , edited by L. Betti and O. Del Buono, Milan, 1974. Il Casanova di Fellini: sceneggiatura originale , with Bernardino Zapponi, Turin, 1974. 4 film: I vitelloni, La dolce vita, 8–1/2, Giulietta degli spiriti , Turin, 1974. Fellini on Fellini , edited by Christian Strich, New York, 1976. Fare un film , Turin, 1980. Bottega Fellini. La città delle donne , with text by Raffaele Monti, Rome, 1981. Federico Fellini: Intervista sul cinema , edited by Giovanni Grazzini, Rome, 1983; as Federico Fellini: Comments on Film , Fresno, California, 1988. Ginger e Fred , with Tonino Guerra and Tullio Pinelli, Milan, 1986. 81/2 (Otto e mezzo) , edited by Charles Affron, New Brunswick, New Jersey, 1987. La strada , New Brunswick, New Jersey, 1987. Fellini's Cinecitta , London, 1989. "Strada sabarrata: via libera ai vitelloni," in Cinema Nuovo (Turin), 1 January 1953. "Ogni margine è bruciato," in Cinema (Rome), 10 August 1954. "Enquête sur Hollywood," in Cahiers du Cinéma (Paris), Christmas 1955. "A Personal Statement," in Film (London), January/February 1957. "Les Femmes libres de Magliano," in Cahiers du Cinéma (Paris), February 1957. Interview with George Bluestone, in Film Culture (New York), October 1957. "Crisi e neorealismo," in Bianco e Nero (Rome), July 1958. "Témoignage à André Bazin," in Cahiers du Cinéma (Paris), January 1959. "My Sweet Life," in Films and Filming (London), April 1959. "Su La dolce vita la parola a Fellini," in Bianco e Nero (Rome), January/February 1960. "The Bitter Life—of Money," in Films and Filming (London), January 1961. Interview with Enzo Peri, in Film Quarterly (Berkeley), Fall 1961. "The Screen Answers Back," in Films and Filming (London), May 1962. Interview with Gideon Bachmann, in Sight and Sound (London), Spring 1964. "'I Was Born for the Cinema': A Conversation with Federico Fellini," with Irving Levine, in Film Comment (New York), Fall 1966. Interview with Pierre Kast, in Interviews with Film Directors , edited by Andrew Sarris, Indianapolis, 1967. Interview with Roger Borderie and others, in Cahiers du Cinéma (Paris), May/June 1971. Interview, in Encountering Directors by Charles Samuels, New York, 1972. "Huit Entretiens autour du Casanova de Fellini," with O. Volta, in Positif (Paris), March 1977. "The Cinema Seen as a Woman," an interview with Gideon Bachmann, in Film Quarterly (Berkeley), Winter 1980/81. Interview with Gideon Bachmann, in Film Comment (New York), May/June 1985. Interview with J.-A. Gili, in Positif (Paris), February 1986. Interview in Monthly Film Bulletin (London), November 1986. Interview with Germaine Greer in Interview , December 1988. Interview with A. Samueli in Cahiers du Cinéma (Paris), May 1990. Interview with Gideon Bachmann in Film Quarterly , Spring 1994. Interview with Liselotte Millauer in Interview , January 1994. Bastide, François-Régis, Juliette Caputo, and Chris Marker, editors, La Strada , Paris, 1955. Renzi, Renzo, Federico Fellini , Parma, 1956; Lyons, 1960. Solmi, Angelo, Storia di Federico Fellini , Milan, 1962. Rondi, Brunello, Il Cinema di Fellini , Rome, 1965. Budgen, Suzanne, Fellini , London, 1966. Solmi, Angelo, Fellini , New York, 1967. Salachas, Gilbert, Federico Fellini: An Investigation into His Films and Philosophy , New York, 1969. Novi, Mario, editor, Fellini TV: I clowns , Rome, 1970. Hughes, Eileen, On the Set of Fellini Satyricon: A Behind-the-Scenes Diary , New York, 1971. Pecori, Franco, Federico Fellini , Florence, 1974. Ketcham, Charles, Federico Fellini: The Search for a New Mythology , New York, 1976. Murray, Edward, Fellini the Artist , New York, 1976. Rosenthal, Stuart, The Cinema of Federico Fellini , London, 1976. Alpert, Hollis, Fellini: A Life , New York, 1981. Fruttero, Carlo, and Franco Lucentini, Je te trouve un peu pale: Recit d'été avec trente fantasmes feminins de Federico Fellini , Paris, 1982. Costello, Donald P., Fellini's Road , Notre Dame, Indiana, 1983. Burke, Frank, Federico Fellini: Variety Lights to La Dolce Vita , Boston, 1984. Fava, Claudio F., and Aldo Vigano, The Films of Federico Fellini , Secaucus, New Jersey, 1985. Kezich, Tullio, Fellini , Milan, 1987. Ciment, Michel, Federico Fellini , Paris, 1988. Grazzini, Giovanni, editor, Federico Fellini: Comments on Film , Fresno, California, 1988. Bondanella, Peter, The Cinema of Federico Fellini , Princeton, New Jersey, 1992. Bondanella, Peter, and Cristina Degli-Esposti, editors, Perspectives on Federico Fellini , New York, 1993. Baxter, John, Fellini: The Biography , New York, 1994. Chandler, Charlotte, I, Fellini , New York, 1995. Tornabuoni, Lietta, editor, Federico Fellini , New York, 1995. Burke, Frank, Fellini's Films: From Postwar to Postmodern , New York, 1996. Méjean, Jean-Max, Fellini, un rêve, une vie , Paris, 1997. Autera, Leonardo, editor, "Fellini e la critica," in Bianco e Nero (Rome), June 1957. Taylor, John, "Federico Fellini," in Cinema Eye, Cinema Ear , New York, 1964. Ross, Lillian, "Profiles: 101/2," in New Yorker , 30 October 1965. Harcourt, Peter, "The Secret Life of Federico Fellini," in Film Quarterly (Berkeley), Spring 1966. Walter, Eugene, "The Wizardry of Fellini," in Films and Filming (London), June 1966. Eason, Patrick, "Notes on Double Structure and the Films of Fellini," in Cinema (London), March 1969. Cox, Harvey, Jr., "The Purpose of the Grotesque in Fellini's Films," in Celluloid and Symbols , edited by Cooper and Skrade, Philadelphia, 1970. "Fellini Issue" of L'Arc (Aix-en-Provence, France), no. 45, 1971. Julia, Jacques, "Psychanalyse de Fellini," in Cinéma (Paris), May 1971. Chemasi, Antonio, "Fellini's Casanova : The Final Nights," in American Film (Washington, D.C.), September 1976. Sarne, M., "Meeting Fellini," in Films and Filming (London), April 1978. Comuzio, Ermanno, "Fellini/Rota: Un matrimonio concertato," in Bianco e Nero (Rome), July-August 1979. Burke, F.M. "Reason and Unreason in Federico Fellini's I vitelloni ," in Literature/Film Quarterly (Salisbury, Maryland), vol. 8, no. 2, 1980. Fumento, R., "Maestro Fellini, studente Angelucci," in Literature/ Film Quarterly (Salisbury, Maryland), October 1982. Dossier on Fellini, in Cinématographe (Paris), January 1984. Polan, Linda, "With Fellini," in Sight and Sound (London), Summer 1984. Gilliatt, Penelope, " La dolce vita ," in American Film (Washington, D.C.), November 1985. "Fellini Section," of Literature/Film Quarterly (Salisbury, Maryland), vol. 15, no. 2, 1987. Lavery, D., "'Major Man': Fellini as an Autobiographer," in Post Script (Jacksonville, Florida), Winter 1987. "Fellini Section" of Positif (Paris), December 1987. Pierson, Frank, "Fellini's Magical 8 1/2 ," in American Film (Los Angeles), June 1989. Benigni, Roberto, article in Positif (Paris), May 1990. Cavazzoni, E., article in Cahiers du Cinéma (Paris), May 1990. Lavaudant, G., article in Cahiers du Cinéma (Paris), January 1991. "New Gigs for Old Pros," in Variety (New York), 20 May 1991. Young, D., "Helmer at Odds over Ads," in Variety (New York), 11 November 1991. Kauffmann, Stanley, "Regarding Fellini," in New Republic (Washington, D.C.), 25 May 1992. Schneider, K.S., article in People Weekly (New York), 18 January 1993. Obituary in Times (London), 1 November 1993. Obituary in New York Times , 1 November 1993. Obituary in Los Angeles Times , 1 November 1993. Obituary in Chicago Tribune , 7 November 1993. Obituary in Newsweek (New York), 8 November 1993. Schneider, K.S., obituary in People Weekly (New York), 15 November 1993. Kauffmann, Stanley, obituary in New Republic (Washington, D.C.), 31 January 1994. Schickel, Richard, "Send in the Clowns: An Aspect of Fellini," in Film Comment (New York), September/October 1994. Goldbarb, Peter, Fellini , for TV, Canada, 1968. Bachmann, Gideon, Ciao, Federico! , U.S., 1970. Fellini's Cinema: Notes of a Director , Italy, 1992. 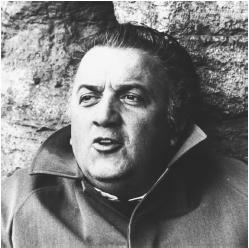 Federico Fellini is one of the most controversial figures in the recent history of Italian cinema. Though his successes have been spectacular, as in the cases of La strada, La dolce vita , and Otto e mezzo , his failures have been equally flamboyant. This has caused considerable doubt in some quarters as to the validity of his ranking as a major force in contemporary cinema, and made it somewhat difficult for him to achieve sufficient financial backing to support his highly personalized film efforts in his last years. Certainly, few directors in any country could equal Fellini's interest in the history of the cinema or share his certainty regarding the appropriate place for the body of his work within the larger film canon. Consequently, he has molded each of his film projects in such a way that any discussion of their individual merits is inseparable from the autobiographical details of his personal legend. Fellini's early film La sceicco bianco gave a clear indication of the autobiographical nature of the works to follow, for it drew upon his experience as a journalist and merged it with many of the conceits he had developed in his early motion picture career as a gag writer and script writer. However, he was also an instrumental part of the development of the neorealistic film in the 1940s, writing parts of the screenplays of Roberto Rossellini's Roma città aperta and Paisà , and his reshaping of that tradition toward an autobiographical mode of expression in La sceicco bianco troubled a number of his former collaborators. But on his part, Fellini was seemingly just as critical of the brand of neorealism practiced by Rossellini, with its penchant for overt melodrama. In a succeeding film, La strada , Fellini took his autobiographical parallels a step farther, casting his wife, Giulietta Masina, in the major female role. This highly symbolic work was variously interpreted as a manifesto on human rights, or at least a treatise on women's liberation. In these contexts, however, it roused the ire of strict neorealists who regarded it as containing too much justification for political oppression. Yet as a highly metaphorical personal parable about the relationship between a man and a woman it was a critical success and a confirmation of the validity of Fellini's autobiographical instincts. This gave him the confidence to indulge in a subtle criticism of the neorealistic style in his next film, Il bidone. The film served, in effect, a tongue-in-cheek criticism of the form's sentimental aspects. In the films of Fellini's middle period, beginning in 1959 with La dolce vita , Fellini became increasingly preoccupied with his role as an international "auteur." As a result, the autobiographical manifestations in his films became more introspective and extended to less tangible areas of his psyche than anything that he had previously brought to the screen. La dolce vita is a relatively straightforward psychological extension of what might have become of Moraldo, the director's earlier biographical persona ( I vitelloni ), after forsaking his village for the decadence of Rome. But its successors increasingly explored the areas of its creator's fears, nightmares, and fantasies. After establishing actor Marcello Mastroianni as his alter ego in La dolce vita , Fellini again employed him in his masterpiece, Otto e mezzo (8 1/2) , as a vehicle for his analysis of the complex nature of artistic inspiration. Then, in a sequel of sorts, he examined the other side of the coin. In Giulietta degli spiriti (Juliet of the Spirits) , he casts his wife as the intaglio of the Guido figure in 8 1/2. Both films, therefore, explored the same problems from different sexual perspectives while, on the deeper, ever-present autobiographical plane, the two characters became corresponding sides of Fellini's mythic ego. Subsequent films continued the rich, flamboyant imagery that became a Fellini trademark, but with the exception of the imaginative fantasy Fellini Satyricon , they have, for the most part, returned to the vantage point of direct experience that characterized his earlier works. Finally, in 1980's La città delle donne , which again featured Mastroianni, he returned to the larger–than–life examination of his psyche. In fact, a number of critics regarded the film as the ultimate statement in an ideological trilogy (begun with 8 1/2 and continued in Juliet of the Spirits ) in which he finally attempts a rapprochement with his inner sexual and creative conflicts. Unfortunately, City of Women is too highly derivative of the earlier work. Consequently, it does not resolve the issues raised in the earlier two films. Several of Fellini's films are masterpieces by anyone's standards. Yet in no other director's body of films does each work identifiably relate a specific image of the creator that he wishes to present to the world and to posterity. Whether any of the films are truly autobiographical in any traditional sense is open to debate. They definitely do not interlock to provide a history of a man, and yet each is a deliberately crafted building block in the construction of a larger–than–life Fellini legend which may eventually come to be regarded as the "journey of a psyche." While the final credits on Fellini's filmography are far from his best works, they nonetheless are fitting conclusions to what is one of the legendary careers in the history of world cinema. And the Ship Sails On is the wildly preposterous but uniquely Felliniesque tale of the miscellaneous luminaries who come together for an ocean cruise in which they will bid farewell to a just-deceased opera performer. Ginger and Fred is a sweetly nostalgic film because of its union of two of Fellini's then-aging but still vibrant stars of the past, Giulietta Masina and Marcello Mastroianni. The Voice of the Moon , Fellini's last feature—which did not earn a U.S. distributor—works as a summation of the cinematic subjects which had concerned the film maker for the previous quarter century. The most outstanding and revealing late-career Fellini is Intervista , an illuminating film (and characteristic Fellini union of reality and fantasy) about the production by a Japanese television crew of a documentary about the director. Fellini himself appears on screen, where he is shown to be shooting an adaptation of Kafka's Amerika , a film that appears to be a typically Felliniesque extravaganza-in-the-making, complete with eccentric extras, surreal images, and autobiographical touches. We watch the filmmaker as he casts Amerika. We meet his various associates and underlings, from producers to actors, from casting director to assistant director. We see how Fellini directs his performers and the steps he takes to inspire feelings and attitudes within them. And we are privy to the various crises, big and small, which are standard fare during the filmmaking process. Finally, Marcello Mastroianni and Anita Ekberg, who over thirty years before had co-starred in La dolce vita , appear as themselves. Mastroianni's entrance is especially magical; the sequence in which he and Ekberg (whom, he remarks, he has not seen since making La dolce vita ) observe their younger selves in some famous clips from the film is wonderful nostalgia. However, Intervista is primarily an homage to Cinecitta, the studio where Fellini shot his films. Revealingly, the filmmaker describes the studio as "a fortress, or perhaps an alibi." Fellini first came to Cinecitta in 1940, when he was a young journalist. His assignment was to interview an actress for a magazine profile. This event is dramatized in Intervista ; at various points in the film, the narrative drifts from images of the real Fellini, an artist in the twilight of a much-honored career, to a recreation of young Federico (played by Sergio Rubini) and his initiation into the world of Cinecitta.To fully appreciate this very personal movie about the movie-making process, you must be familiar with—and an admirer of—Fellini and his work.